That Lloyd. He has vision and he just can’t pass up a bargain. Usually these things work in my favor, but I think that even he will admit that it causes some discomfort before that magic time actually happens. Way back in October, he saw some sturdy outdoor benches at a surplus auction. “Those would be great for your school’s future playground,” he said. “You mean three years from now?” I asked. I pointed out that there were way, way too many benches, but he pointed out that some of them were in bad shape and you could use the extras for parts. I pointed out that you could accomplish the same thing with just two or three benches. We kept pointing things out, but eventually I got tired of it and left to go shopping. When I returned, we were the proud owners of a bunch of benches. I admit that it was a good deal, but there was still the problem of where to store them for three years. He said he knew a guy. Well, he did know a guy, but after a couple of months that guy needed the benches moved offa his property. We had a plan to keep them at a friend’s farm, but she wasn’t available today, so Lloyd drove them home. 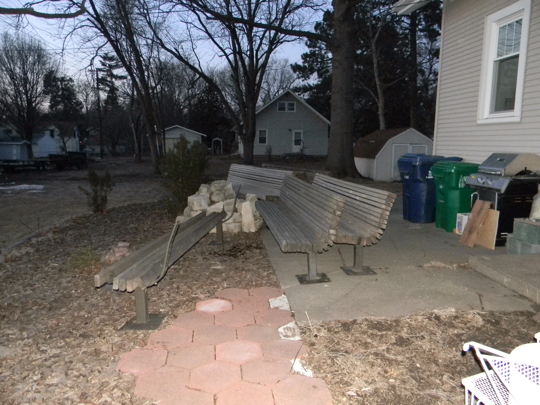 Now there are six or so benches on my back porch. God bless Harold (Strongest Man In The World) and our neighbor Mr. Durre (super nice guy and Truck Saver) as they helped Lloyd get them from the trailer to the backyard. 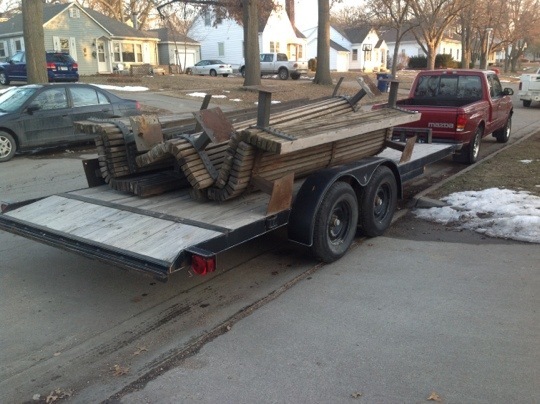 It seems like the benches are disappearing though -- If I counted correctly there are 11 in the first picture, 5 on the trailer and 4 in your backyard. Termites? Ha! There are two more benches behind that back one in the yard picture -- my flash couldn’t make them show up, but you’re right: Where are the other benches, Lloyd? How many did you buy? 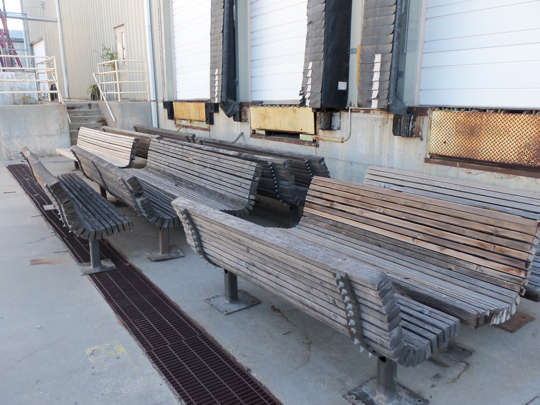 There were a total of about 16 benches at the auction. The first couple went for $25 each then $20; then $15; then a few for $10 each. Then I bought the remaining 7 benches for $8. So they cost about $1.25 each with tax. Not bad for $700 benches. Messiah Lutheran was going to take two of them to use in an outdoor worship area and they were going to store the rest of them until we had a new pre-school, but that fell through. They are made of redwood, and the hardware is really well done. You don’t see anything but wood from the front. They are the benches that used to be at UNL. Looks like you have a good supply of wood for the firepit. Here’s my suggestion: Keep the benches on the lawn & have outdoor movie nights when the weather is nice. I’ve done this in the past (without the benches) & it’s alot of fun. I would assume Lloyd has picked up a projector & screen in his travels. Be sure to have lots of food. So are you going to keep them in your yard for three years now, or will they eventually go to your friend’s farm? I think they make a lovely addition to the back yard. Arrange them around the edge of that concrete. You will have seating for lots of people. Brats, anyone? Dad says you take after your Mom, bargain hunter, but the truth be known Dad is the better bargain hunter. Sigh, I guess Lauren there is No way he could pass up a bargain. He comes by it naturally.